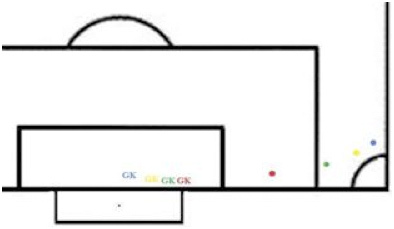 Keeperstop.com > Goalkeeper Drills > Positioning and Angles: Where do I stand and where do I start? Positioning and Angles: Where do I stand and where do I start? 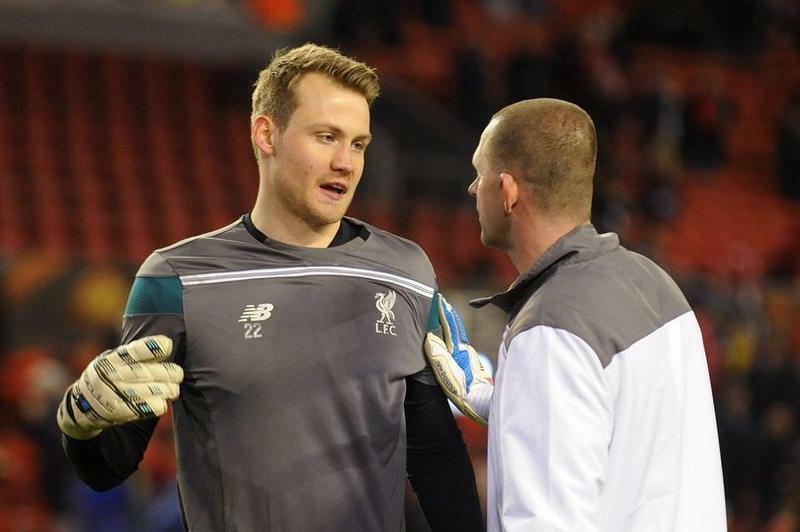 If you’re not in the right place it can be difficult to make the save, if you are, the save becomes much easier. I tell my keepers that you can have the best technique and be very athletic but if you are not in the right position when the ball is struck your chances drop dramatically of making the save. Conversely, you can come up big if you are in the right position. Ball Line: The line from the center of the goal to the ball (fig. 1 dashed line). That line should run right through the center of your body. 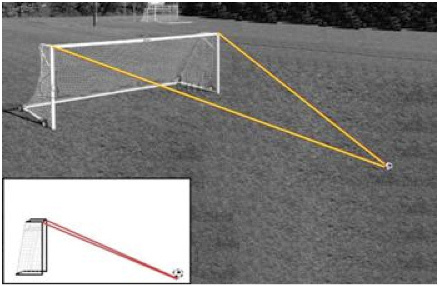 Angle: This is the angle created when you draw a line from each goal post to the ball (fig. 1 red lines). You should be splitting this line down the middle. This line also shows you how much goal you are covering. The further off your line you play the smaller the width of the goal. The ball line and splitting the angle are effectively the same thing, although your ball line does not show you the width of the goal based on your position forward and back. Also, your position forward and back creates a vertical angle not often considered; that is the goal height in relationship to your positioning (fig. 2). Given these considerations I recommend that you learn to play 2 to 3 yards off your line and adjust as needed from there. This gives you the best angle and ball line on a majority of shots in the penalty area. “No mans land”: No man’s land is that area you avoid, this is a position that does not allow you an opportunity to save an arcing ball at the goal line or be close enough to the striker to influence their shot. 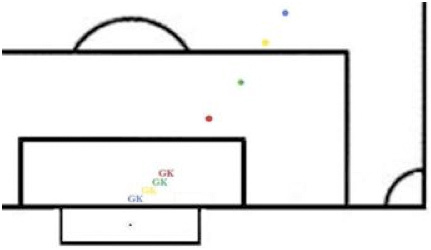 Often keepers find themselves here when they don’t close down a breakaway/through-ball fast enough or they are playing too aggressively off their line when the ball is in striking distance. Balls on the flank :You should handle balls on the flank like a reflection in a mirror… the closer the ball is to the touch line and goal line the more central you can be in the box, once the ball starts moving into the 18 and into striking distance you start moving to cover near post (fig. 3). Use caution here if you are on a non-regulation size field, many fields in youth soccer are far from regulation, making the touchline closer and more dangerous. I suggest that you ask yourself the question: “Am I in a good position to reach a service into the box and if they rip a near post shot from right there can I make the save?” if the answer is yes to both you are in the optimal position. Balls at the top : Are handled similarly to balls on the flank. By this I mean in a “reflection in a mirror” fashion (see fig. 4), although the risk is greater here since the goal is bigger than when the ball is on the flank . This also takes more skill in reading the play and letting that dictate your positioning. In general once the ball enters the attacking third you will tend to be closer to your line. When the ball moves into striking distance you will start to close down the angle without exposing yourself high. The question you ask here is “ am I in the best position for a driven ball (able to minimize the angle) and still able to get back to the bar on a chipped or flighted ball” if the answer is yes to both you are in the optimal position. Positioning is also going to vary depending on your height and physical abilities (vertical jump, footwork. Etc.). 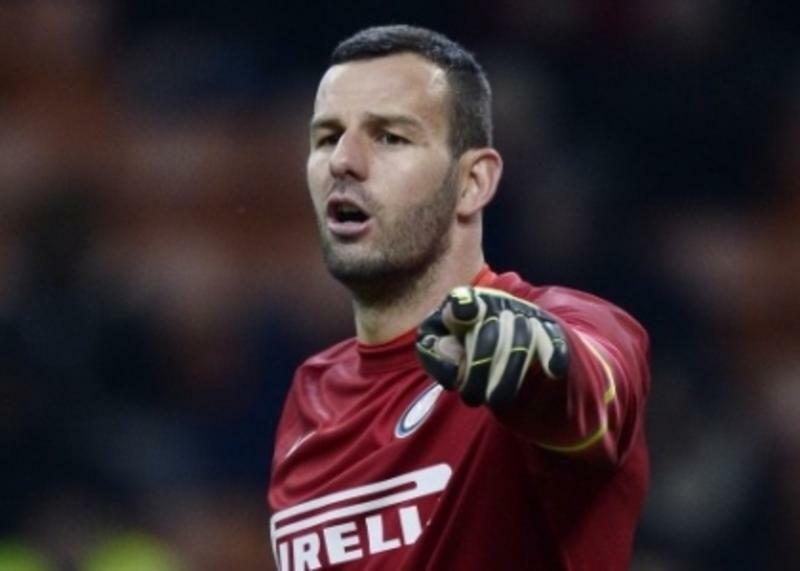 You have heard the term “getting caught off your line”, that means the GK has probably been beaten high because they were too far out, beyond their ability to track back for the high save. But there is also as much or more risk in staying “married” to your line. When you camp on your line this makes the goal very large and scoring opportunities very easy for the opposing team. Looking for opportunities: Your position should also put you in a location to easily get to flighted balls and get a jump on through-balls /breakaways. This requires you to read and understand what is happening in the game. Who has possession, how close are they to goal, do they have time and space, are they looking at one of their teammates for a run, are they looking at you to see where you are standing? All of these indicators may dictate minor adjustments in your position and stance to give you an edge at getting to a ball in the penalty area. This is beginning element of “controlling the box”. If you can shut down a play before it becomes dangerous you will make your job that much easier. You have an obligation to support your back line and be an option for redirection of play. This requires you to move up and out with the flow of the game. When the ball is in the opponents end under your teams control you should be out midway between the center circle and the top of the “D”. You need to always be ready for long balls through and to help your team out of a foot race with a pass-back. Think of yourself as a shark patrolling the open water between you and your back line. Reading the rhythm of the shooter: This is a skill that is critical to a goalkeeper, it takes lots of game time spent handling a variety of shots to learn when and how the shot will come. Based on the rhythm of the shooter you may “step into” a driven shot, cutting the angle just a bit more. If you are expecting a flighted ball high to the cross bar or a chip reposition back a step (Do not cheat on a shot or cross, a good striker will make you pay for getting even slightly out of position). A charging striker, under pressure, coming in with head down body over the ball will have a difficult time getting a chip off and will probably drive it. A striker outside the 18 with time and space and an upright body language looking to see your positioning may try to hit you high. These are not hard and fast rules but you can quickly gain a lot of info on the types of players in the game in a few short minutes. The game is really where you develop and refine this skill. The more you play the more you understand what works and what doesn’t. I always say test and learn your range in practice and scrimmages; if you play conservatively in practice you will never learn the extent of your range or improve your range in a game.